Eden Tolly Signature Plus is one of the residential developments by Eden Group, located in Kolkata. The project offers very well designed 2BHK and 3BHK apartment. The project is well connected by various modes of transportation. The site is in close proximity to various civic utilities. Tollygunge serves as a terminal point of several transport services including the tram, city buses of Kolkata tramways and metro stations. Famed as the center of the Bengali film industry, it is located in Southern part of Kolkata. Good connectivity, availability of modern and essential amenities and civic utilities, wellstructured commercial buildings, and ferrous infrastructure has given a positive growth to this locality. Therefore, buoyed with positive sentiments, the city is becoming as one of the preferable places to invest in the real estate sector. Based on the east shore of Hooghly river, Kolkata defines culture and festivities. It is the main financial and commercial hub of NorthEast India. The strong transport network and ferrous infrastructure have listed Kolkata in top Indian city in terms of wellplanned public transportation network. From residential apartment to luxury homes, Kolkata offers variety of option to the homebuyer. The property rates in Kolkata is much lower in comparison to other metropolitan cities of the nation. The city has received positive sentiments in demand of real estate. What is the location of Eden Tolly Signature Plus?The location of the project is Tollygunge, Kolkata South. What is available flat size in Eden Tolly Signature Plus? Flat sizes in the project range from 866.0 sqft to 1616.0 sqft. What is the area of 2 bhk in Eden Tolly Signature Plus? 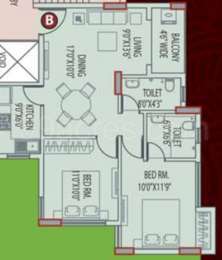 The size of a 2BHK unit in the project ranges from 866.0 sqft to 1151.0 sqft. 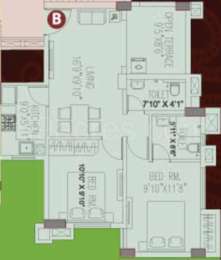 What is the area of 3 bhk in Eden Tolly Signature Plus? 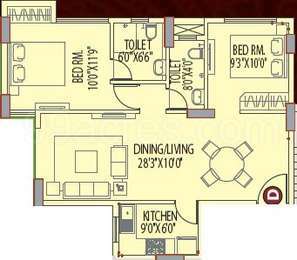 Three-room units (3BHK) in the project are available in an area of 1192.0 sqft to 1616.0 sqft. How much is the actual area of Eden Tolly Signature Plus?The area of the project is 0.61 Acres. What is total price of 2 bhk in Eden Tolly Signature Plus? The price of 2 BHK units in the project ranges from Rs. 3733800 to Rs. 4834200.